“A true American fairytale”— that’s how Barbara “Bobi” Sanderson describes her life. In the 1600s, both sides of Bobi’s family traveled from England to settle in the early North American colonies. Before that, her father’s side of the family relocated from France to England. In fact, after continually being referred to as the “French family,” they legally changed their last name to “French” (Bobi’s maiden name). Bobi’s oldest-known relative was buried in Cambridge, Massachusetts, in 1691, and was recognized as the building project director for Harvard University. Years later, when the government began offering land grants to those willing to farm and improve land in the western region, her father’s side of the family loaded up their wagons and moved west. On the other hand, Bobi largely knows her mother’s side of the family as river and canal engineers, who worked on canals ranging from Canada to the Chicago area. In the 1800s, they eventually settled in Ottawa, Illinois, where the Illinois River and the Fox River meet. Later, her father’s family was also drawn to this small town, becoming bankers, judges, and other central figures of the community. After high school, Bobi wanted to experience other parts of the world. She left Ottawa to attend Smith College in Northampton, Massachusetts; however, after World War II began, she transferred to Northwestern University in Evanston, Illinois, to be closer to family. During her time at Northwestern, Bobi went on a blind date with a lawyer by the name of Edward “Sandy” Sanderson. After a few months, the two were engaged, and were married by the end of Bobi’s junior year in college. They settled in Sandy’s hometown of Evanston and had two children together, a daughter and son. Today, they have blessed Bobi with four grandchildren and six great-grandchildren. In 1972, after the children were grown and Sandy retired, the couple visited with friends on Siesta Key. They fell in love with the area and, before leaving, put an offer on a piece of land on Longboat Key. They used it as a vacation home for two years before they relocated to Sarasota full-time. Coincidentally, it turned out that a number of people they had known in the Chicago area had moved to Sarasota as well. “It was like having our own little Chicago community right here,” she laughs. In 1992, Sandy passed away, and at the urging of her children, Bobi decided it was time to get back to traveling. They signed her up for a trip around the world on the Holland-America Rotterdam cruise ship. It left in January of 1993 and didn’t return until April, 103 days later. “That trip changed my life,” Bobi says. “I realized I had a lot of living left to do.” While Sarasota remained her permanent residence, she made a point to continue her travels. Later, in 1999, Bobi was introduced to Dr. Jim Griffith. They “met” over the telephone and, ironically, the two had both signed up to live at Plymouth Harbor before meeting. They remain together to this day, enjoying art, music, and traveling. In July, the two are setting off on a three-week cruise to Norway. Throughout her life, Bobi has always been involved in the community in one way or another. 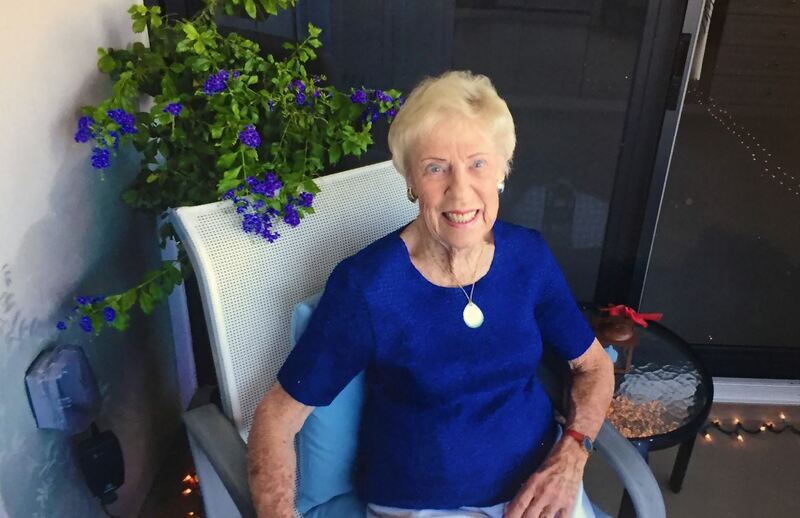 In Evanston, she served as a tutor for local grade schools, worked with the YMCA, the garden club, local government, and much more.